Bundesliga | Bayern Munich's Arturo Vidal: "It's always good to score first"
Bayern Munich's Arturo Vidal: "It's always good to score first"
Arturo Vidal was in inspired form for Bayern Munich at home to Augsburg on Saturday, scoring one and creating another in a 3-0 win to help the Bundesliga leaders extend their advantage at the top of the table to six points. Speaking after the final whistle, the 30-year-old Chilean gave his thoughts on the triumph, his own scoring record and relationship to head coach Jupp Heynckes. Arturo Vidal: Thankfully we're doing really well and we've picked up good results and won all our games, which is the most important thing. Vidal: Yes, and I'm very happy. Not just about the game, but I also feel very fit physically. I had these two weeks [during the international break] to recover and train hard, so I feel I'm at 100 per cent. That helps me to keep playing well. Question: You've now scored 25 goals in the Bundesliga and six of your ten league strikes for Bayern have been to make it 1-0. What does that mean to you? 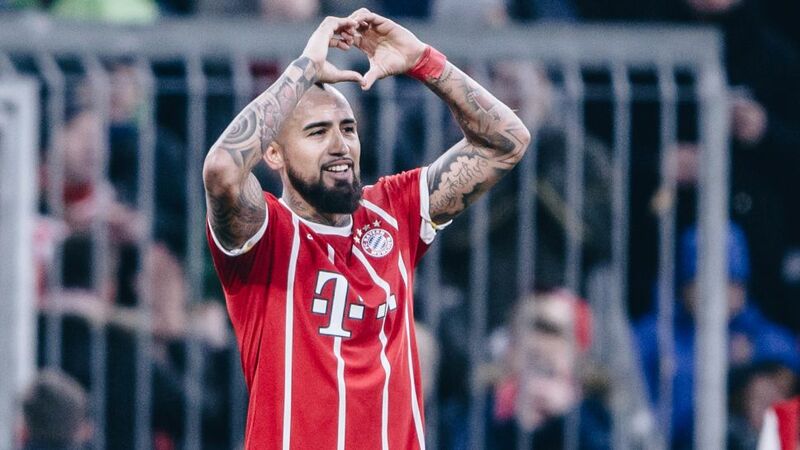 Vidal: It means a lot, it's very important to me and that's what I work for. I hope I can keep helping the team. It's always good to score the opening goal because you can play more calmly if you do that. I hope I can stay in the starting line-up and that I can keep scoring. Question: Was this game a vindication of sorts, after the criticism you've faced from some quarters? Vidal: No, that's just stuff that has been said in the press but I'm very laid back. I know how valuable I am and how much effort I put in every day. I give my all in every training session so I'm very focused on what I'm doing and people are very appreciative of what I do. Vidal: It's spectacular. You can only applaud him for everything he's achieved over the course of his career. Question: How do you get on with him? Vidal: We get on well, we have a good relationship. We met when we were both at Bayer Leverkusen and had two great years there, playing in the Champions League. After that we could've worked together again but it didn't work out. We both went our separate ways, but we're back here together now. We get on well, as do the whole team. Vidal: We hope so. We hope we can win it and the Champions League, which is our primary objective.